"In this day of the automobile, in our effort and haste to reach a distant scene we are apt to overlook the many desirable and beautiful points of interest with and just outside of our corporate limits. I know of no place that surpasses Troy and vicinity in the attractions it offers to the ordinary pedestrian, or to a more fortunate one who has an automobile at his disposal. To such a one I would suggest that he take several afternoons and make a tour of inspection or survey of our many points of interest, such as, for instance, the road leading to Diamond Rock, so well described, and its beautiful Indian Legend so well told by N. B. Sylvester in his 'Northern New York and Adirondack Wilderness,' a book written, printed, and published in Troy in 1877." "[The Church] can minister to the needs of the community with tenfold more power if she will unite her forces. Important as the Church is, it is evident to all that Troy is over-churched; and too many of those churches are, unfortunately, neglectful of one another and are treated in differently by strong men who ought to put into them all their power of heart, and brain, and purse. "There are too many churches of the same denomination. This means a great waste of spiritual energy, and a needless waster of money. Fewer churches and large congregations, giving the minister a man's job and making it more worth while to be a minister. It would mean strong pulpits by increased salaries paid the ministers, the majority of whom are underpaid. Many of them with college and seminary training are receiving less than plumbers and masons. To be of the largest service to his Church and the world, the minister must have competent income." "The greatest improvement made in Troy during the last fifteen years is not the miles of new pavements, nor the new lighting system; it is not the increased size of our great collar shops nor the cleanliness of the city, but it is to be found in our school system. We have new buildings - more pupils in attendance - a much higher standard and far more interest in educational work on the part of the people of Troy generally. There is far more money appropriated for educational purposes, and this money is spent to better advantage than ever in the last fifteen years. "Now that we are looking forward to a better Troy, the one thing that will produce the greatest amount of betterment is to do still more for our Troy boys and girls. We must try to fit Troy boys and girls for practical work in some particular fields of industry. A beginning at the Central School has been made along this line. 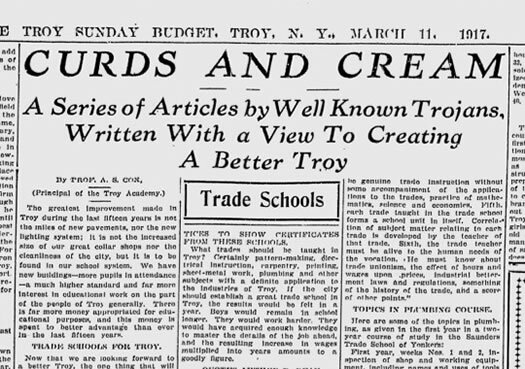 Superintendent Smith is doing all he can with the means at his disposal, but if Troy is to keep pace with progressive cities of the country, we must take up the matter of trade schools, part time or continuation schools, and applied art schools." "In discussing the future of Troy, let us not dwell to any great extend on what Troy has lacked. We all know our shortcomings. It is necessary, however, to first analyze what we must eradicate, and secondly, to suggest the things that are requisite to a growing and progressive city. "We must learn to 'pull together' for the benefit of the city; we must eliminate petty jealousies, and the spirit of 'I won't play if you don't do it my way.' We must cut the politics absolutely out when it comes to the welfare of the city. Let us stop 'washing out dirty linen in public,' to the advantage of competing neighbors. Let every one of us stand for Troy first and not the personal ambition and political preferment. When it comes to matters of importance, between our city and the outsider, let us see to it that we are a unit as a community. A division in the ranks allows the use of the wedge that prevents many successes. It will not help the growth or the development of Troy to advertise its shortcomings. It will not bring more dollars into the community, nor can it make real values greater." "What's the matter with Troy? There's nothing the matter with Troy. Perhaps we think that there is more lacking than there actually is. If things look bad and discouraging to us, perhaps a month or two spent in some other city would make us more appreciative of our own advantages. I am quite sure that if we could consolidate all of the brains, money and ingenuity in Troy, with the idea of putting the city where it legitimately belongs, we could ride home in through trains on elevated crossings not later than 1920." I will preface the comment below by telling you that I was born and raised in Troy. I love the city, I appreciate it's rich history and all of the hard work some people are making to make it a better place. That being said, Troy is well known for its corrupt political practices and cronyism. Itâ€™s been that way for years. Now, letâ€™s look at the rest of the city. You, know, the parts that lie outside of the hip several block corridor of the downtown that some folks like to refer to as this or that swelegant neighborhood in Brooklyn. The rest of the city is a mess. Have you driven up Hoosick Street? Have you driven through South Troy? Have you walked up 4th Street between Congress and State? What happened to the decent restaurants downtown? If you wanted to go out for a nice dinner, where would you go? No really, besides the Confectionary and Lo Porto where would you go for a nice dinner? If Iâ€™m walking around on a Friday evening, where would I go for a nice dinner with nice wine and exceptional food? Please stop looking through such rose colored glasses my friend, itâ€™s the only way to look at the city realistically and begin realizing what Troy really needs to happen to make changes the entire city will benefit from, not just the hipster few that call downtown their own little Brooklyn north. We've had decades of people realizing what Troy, and our other cities, need to to make happen, and doing very little about it. But it's the hipster few who are actually doing something about it, investing in it, and making a place where they and others want to live, so I don't see the point in being critical of that.